On a recent trip to see the Fraser Valley Bald Eagle festival, I overheard a woman mutter “I drove two hours for that?” after hiking a kilometer to peer through a scope for a fuzzy view of an eagle two kilometers distant. I wanted to tell her I had driven eleven hours for that view, and like her, was disappointed. Pulling into the Harrison River RV Resort – one of the festival viewing sites – the trees were empty of anything other than leaves. “Where are the eagles?” I asked a gentleman ambling by, his thick coat and wool cap at odds with the sunny skies. “They aren’t here yet. The festival is too early,” he lamented. My heart sank. Nature is unpredictable and festival organizers can’t order a few hundred birds to show up on demand. I continued the search at another viewing site. “The water is high and Sockeye salmon won’t swim up river until levels drop,” a gentleman explained as I warmed my hands over a roaring fire at Tapadara Estates, the closest community to the Chehalis Flats Bald Eagle & Salmon Preserve. I counted almost 100 eagles perched or walking among salmon carcasses on the estuary mudflats; not bad for a morning of bird watching but far fewer than the thousands of eagles that I expected. 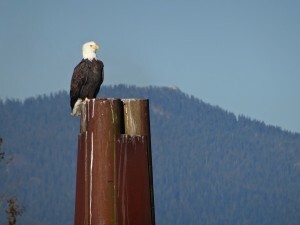 My spirits plummeted lower than thermometer mercury in January as I headed to the last place for eagle viewing – a jet boat tour of the Harrison River. “There were hundreds of eagles out there,” I overheard one woman tell her friend in the parking lot. My pace quickened as I headed to the launch site. The Fraser River Safari doesn’t use an average jet boat. Built for touring, its large glass windows and skylights provided clear views in every direction while sheltering us from cold winds. Capable of hitting eighty kilometers an hour, the boat handled strong currents with ease. With few eagles on the Fraser River, we headed up the thirteen-kilometer Harrison River to find Canada’s largest bird of prey and one of 59 eagle species in the world. My mouth gaped as I counted twenty-one eagles in a single tree while dozens more circled above! Covering hundreds of kilometers in a single day, thousands of eagles arrive in British Columbia as Alaska’s rivers freeze. Jo-Anne Chadwick of Fraser River Safari estimated we were looking at about five hundred eagles shoehorned into a three-kilometer stretch of the river. Trees lining the banks looked like they had been showered in golf balls – the white heads of mature bald eagles clearly visible among darker branches. This spectacle was breath taking, but at its peak with several thousand eagles, the migration would be one of the most impressive wildlife sights on the continent. And I would have missed it if I hadn’t booked a jet boat tour. Too often, North Americans resist spending money on a guided tour while on a domestic trip, preferring to lead themselves. Perhaps they want to save money or the environment seems too familiar to require an expert, but I’m convinced hiring a guide is the way to find the best in every destination, even the ones you think you know! The Argument Against Independent Travel. Click to Tweet. Can you imagine 21 eagles in a single tree? It happened on this adventure! Discover more. Click to Tweet. This eagle spectacle will take your breath away! Find out more about this adventure. Click to Tweet. Shooting bears with cameras, not guns, brings in more money. That’s the conclusion from the Center for Responsible Travel (CREST) in their recent study on the potential of bear viewing ecotourism in British Columbia’s Great Bear Rainforest. With increasing emphasis on conservation and low-impact tourism, bear viewing in the area has grown rapidly in the last decade. Now bear-viewing tourism generates 12 times more visitor spending than bear hunting and 11 times more direct revenue for the B.C. government. The chance to see bears is attracting visitors from Europe, Asia and the United States. These long-haul tourists are attractive to tourism operators as they usually spend more than regional travelers. Hunting also attracts long haul travelers, mainly Americans, to spend large dollars on trophy hunts. CREST undertook their survey to determine whether consumptive or non-consumptive tourism was more profitable. And it appears a live bear is worth more than a dead bear! Shooting bears with cameras, not guns, brings in more money. Learn more here: Click to Tweet. An Explorer’s Viewpoint on Reinventing Bears via @Reinventure. Click to Tweet. 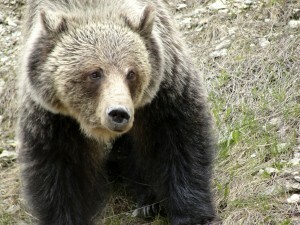 Bear-viewing tourism generates 12 times more visitor spending than bear hunting. Learn more: Click to Tweet.